This cake...OHHH this cake. 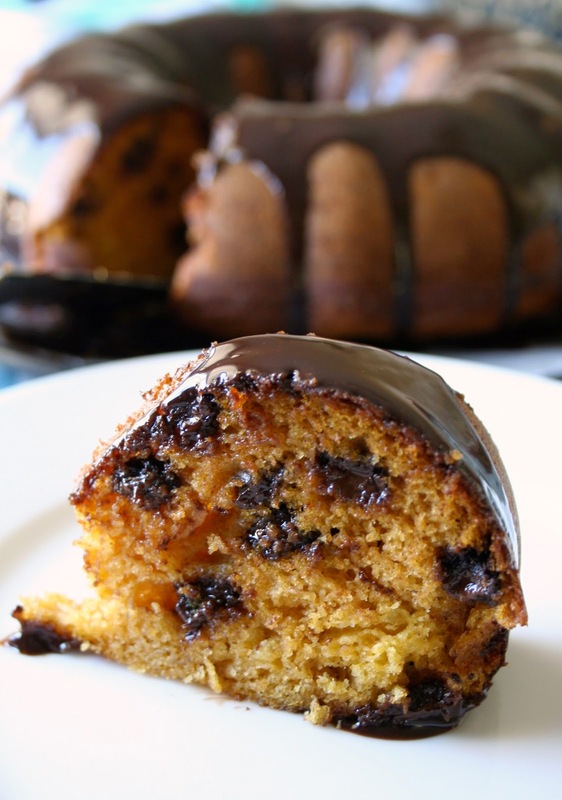 If you are only going to make only one pumpkin baked good this fall, THIS needs to be it. I am completely obsessed and am pretty sure I will be making it again. 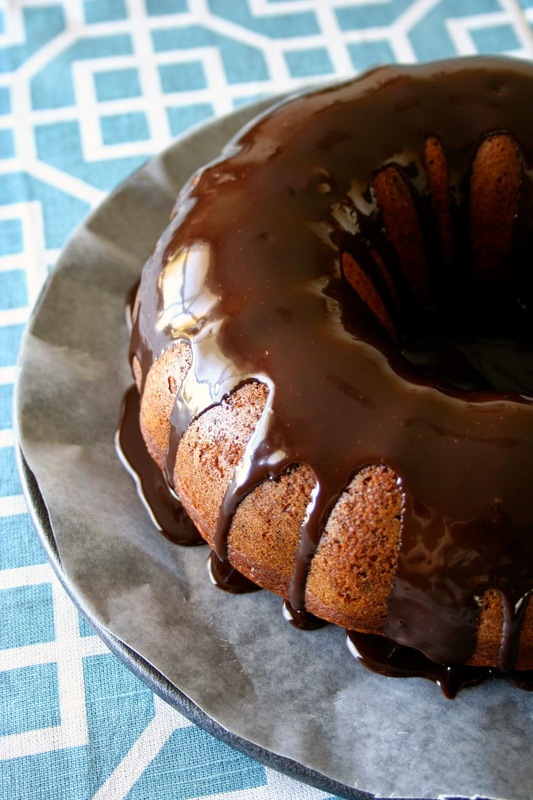 The cake was ooey, gooey, chocolately, had the perfect pumpkin flavor and was just to die for. And the chocolate ganache?? Wow. And who knew how easy it was to make ganache? Not this girl. Doesn't this look so good?? I was actually surprised with how easy this entire cake was to make and I'm not much of a baker. Please tell me that you'll make this cake. At least twice. And MAYBE share it with some friends, which is what I did so now I need my very own. It's technically the start of the "holiday" season right? So bring on the baked goods! 1. 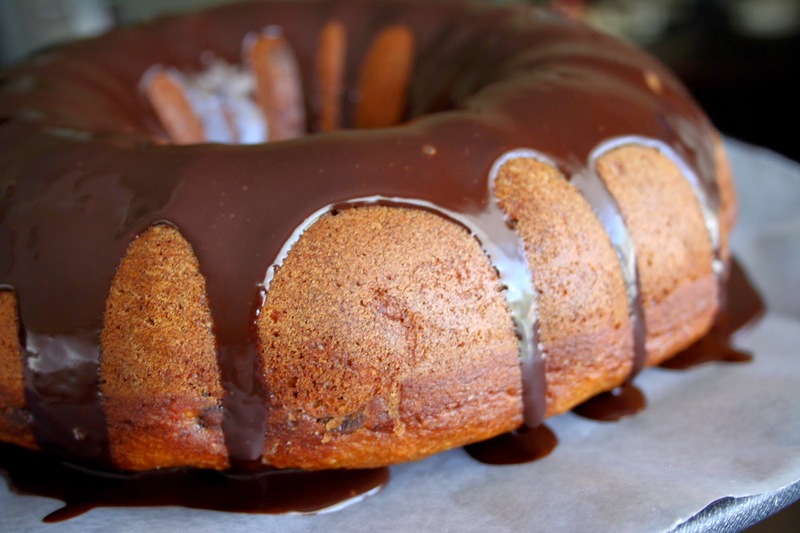 Preheat oven to 350 degrees F. Grease and flour a 12-cup Bundt or tube-cake pan; set aside. 2. In a large bowl combine eggs, pumpkin puree, sugar, oil, sour cream, vanilla extract, cinnamon, pumpkin pie spice, allspice and whisk to combine until mixture is smooth and silky. 3. Add the flour, baking soda, salt and stir until just combined (don’t overmix or the gluten will over-develop and cake will be tougher). 4. Fold in the chocolate chips and pour batter into prepared pan, smoothing it lightly with a spatula if necessary and give it a slam on the counter to release any air. 5. Bake for 38 to 42 minutes, or until top has set and is golden or a cake tester, toothpick, or blade of a knife comes out clean (due to the chocolate chips, you may hit some chocolate patches). Allow cake to cool in pan for about 15 minutes before inverting and releasing cake from pan and placing it on a rack to finish cooling. 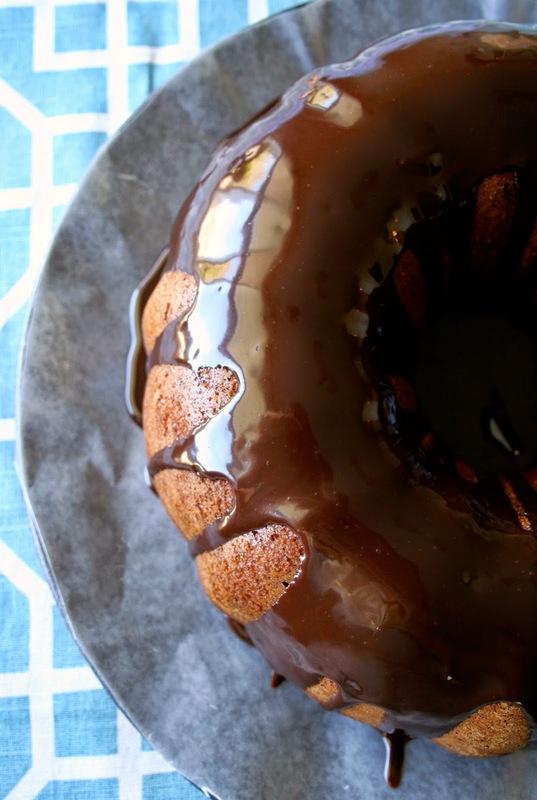 While cake cools, make the ganache. 1. Place chocolate in a medium microwave-safe bowl and heat on high power for 1 minute to soften chocolate; set aside. 2. In a small microwave-safe bowl or measuring cup, heat the half-and-half on high power just until it begins to bubble and show signs of boiling, about 30 seconds to a minute. 3. Pour hot half-and-half over chocolate and let stand 1 minute. Whisk vigorously until chocolate has melted and mixture is smooth and velvety. Add vanilla and whisk to combine. Set bowl aside for about 5 minutes, allowing ganache to cool and thicken a bit. 4. Whisk mixture briefly before preparing to drizzle it over the cake. Ganache will set up a bit with time, but remains quite viscous and drippy. 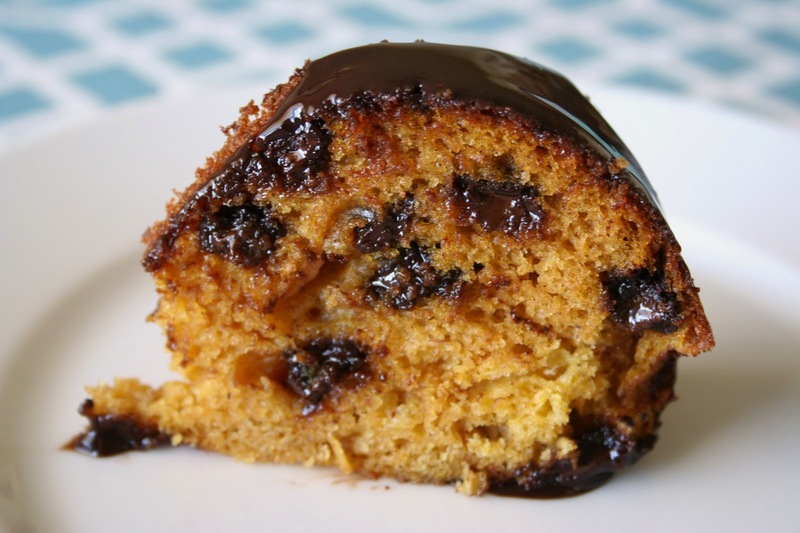 *Cake will keep for up to 5 days in an airtight container at room temperature.